There is an increased popularity of RC helicopters, and many varieties have come available lately. You might find it hard to find the perfect one, but finding the right one isn’t that hard if you know what to look for. We can help you find the best RC helicopter for beginners. First, you have to know that the most expensive RC helicopter doesn’t mean the best. You need to consider that the type you choose depends on your skill level, here are the top 5 best RC helicopter for beginners. This model is the best beginner RC helicopter since it’s by far the most stable in the market. The Lutema Hovercraft won’t let you down as it turns out to be a crowd pleaser. It's 8 inches in length and utilizes the 4-channel technology. Compared with other RC helicopters, the Lutema hovercraft has a fully functional hover, and its stability is second to none. You will love this RC helicopter since it can maneuver in all the directions and also the spare parts are widely available. It’s perfect for the beginner as it will still be fun to fly even when your skills have improved. ​If you would prefer to have a larger RC helicopter, then you should definitely check out the Amosting RC helicopter. This helicopter has perfect dimensions for a beginner chopper, which is also one of the largest available in the markets. Syma has a reputation for making high performance and high-quality RC helicopters. The Syma s107 is very affordable, yet it is of excellent quality and has good performance. ​This type is the best type to introduce you to RC helicopter world. The s107 has a durable metal frame, an internal gyro that ensures stability and it’s easy to control. ​This model is really only suitable for indoors flight, just a little wind with influence this helicopter and make it tough to control. It also has full three channels: up, down, left, right, forward and backward. Utilizes 3.5 channel technology. ​With these amazing features, the Syma s107 makes it to among the best RC helicopters for beginners. Unlike most RC helicopters, the iFly doesn’t come with a remote control transmitter. It only requires an iDevice to control using an app that is available for download for free. If you love tablets and phones, then this is a perfect choice. This type has a hard and durable frame, easy to control, internal Gyro and its ready for stunts. It has a 3.5 channel control. The model is powered electrically and comes with a 3.7v rechargeable battery. Drones have been a hot topic everywhere, and a four rotor quadcopter is among the best. The spy drone has a 2.4 GHZ transmitter and thus there is no radio interference and also offers a 360 degrees stunt mode. This drone is perfect for you as a beginner. It has four main rotors, 4.5 channel internal gyro for greater stability and thus it’s easy to control. 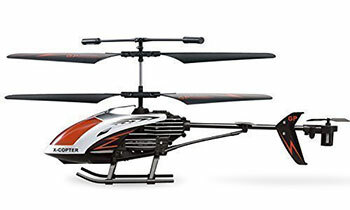 The features in each and every one of these top 5 remote control helicopters make them a perfect choice for beginners. With their construction and controls, you will find them all easy to fly. If you've never flown before, of course you will find it difficult at first. So be sure to buy a durable RC helicopter that is also easy to fly. The selections above are some of the best choices out there. Here are a few other features to look for. Obviously you will prefer good performance, therefore, look at the age range for the model, the number of channels available in the remote, number of blades, types of battery, etc. these helicopters aren’t too advanced and thus enable you to get the experience. The moment you get familiar with flying a RC helicopter correctly, you will want to upgrade and select the ones with more capabilities and features.